Lovely photo David. How old are these cottages, I remember them from when I was a lad, and that's a long time ago. What a lovely shot..and a dream place to live...sigh. Apart from the lamp post and the German metal, this is very much as I remember it. A good shot, especially of the tree canopy. Its as if time has stood still apart from the car, lamp and cones! A beautiful location to live in without a doubt. My friend lives further down the lane; it really is a lovely place to live. Certainly a nice place to live, though I doubt many of us could afford to live there, for the well off, i those cottages would be about £300,000 at least. But I couldn't imagine living next door, imagine the neighbours to be snobby. It's bad enough were I live on a normal estate were neighbours are very unfriendly. Why would you think I was snobby Al ?, and what precisely is it about my Audi that you find offensive Gary ? Only Labour voters would think that the neighbours would be snobby. Mick, I can get up Greenough St. at tea time on my vintage Raleigh quicker than any of these fancy motors. Or pretty much anywhere else in Wigan if it comes to that. That's a great photo David. Mick, how in the world can you possibly imagine that only LABOUR voters could find their neighbours snobbish? I see you are still talking rubbish, Mick. Whys is that Mick? Exactly? My friend who lives further down is certainly no snob, I assure you, Al. You would have to travel a long way to find a nicer person. They can all keep their fancy five bedroom ultra modern houses. Give me a lovely stone cottage any day! I'll keep on doing the lottery and hope for the jackpot! This view is to die for in any season! All these comments and we still don't know how old they are??? I have always been a snob, I carry the buckle as we upper classes say. I don't look down upon others but simply look beyond , towards the horizon, I feel safe there, with my own , never looking down as we sip coffee. I am my self , a place, yes, a place..
Vb thats all I dream about when I get my lottery ticket. The friend that Irene mentions is indeed no snob..and is a most lovely person. "From where".... I don't look down upon others either, but neither do I look up. I am comfortable where I am. It's good to dream Maureen. The money is spent before you get it ! You can go anywhere in your imagination! 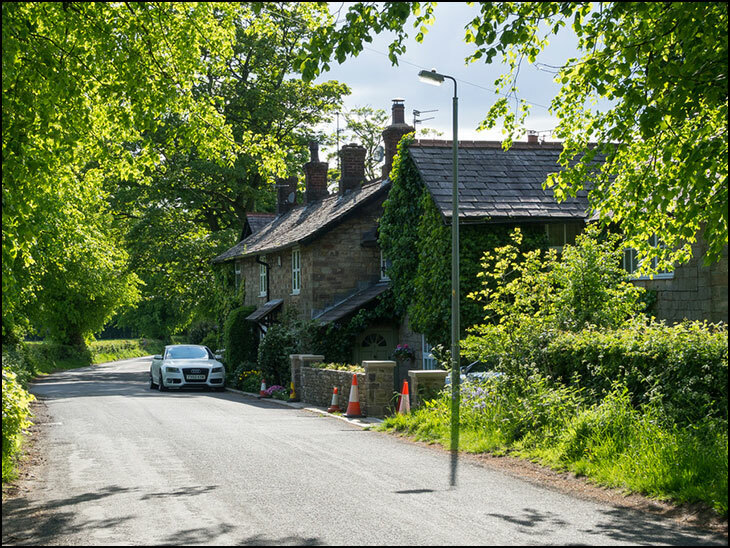 I am intrigued by the position of the lamp post, is it actually 3' into the road ? The lamp post is well off to the side, what we are seeing is the shadow creating the lower portion of the post. I have spoken to three people who live in the cottages. None of them appear snobby, nor do they seem the kind of people who would make rude, ill founded comments about others. look good but tiny.why is the lamppost in the middle of the road.